24 Hour Pest Control London And Hertfordshire Emergency Services! Bed bugs conceal themselves very well although visible to the human eye. Remain at most times undetected retreating into a range of cracks and crevices in its environment your abode! A very good method of gauging if you have bed bugs is applying very sticky double sided or carpet tape on all sides of your bed frame, thereby catching them or even as a temporary measure to help against immediate biting as the host sleeps. Generally black dots closely bunched together are signs of bed bug faeces. Surprisingly bed bugs also hide under your carpets. These insects need to be where a host is going to be, for an extended period. If in the bedroom, they will come out at night while the host is sleeping, from hiding places such as the frame and headboard of the bed, behind any loose or peeling wallpaper, cracks in wood-work or plaster, from behind ward-robes or bedside cabinets. In the lounge area, they favour soft furnishings and are often found around the arm joints of armchairs and settees. 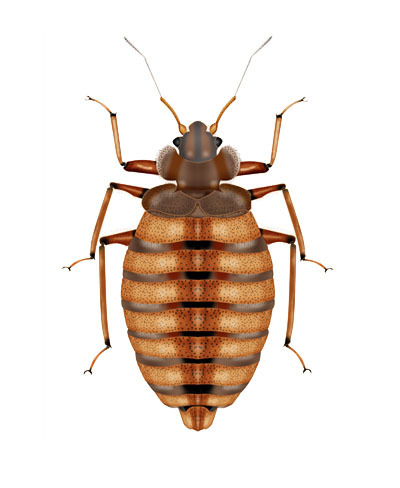 Adult bedbugs are 4 – 5 mm in length, wingless and uniformly mahogany brown in colour. They have long well-developed walking legs with efficient tarsal claws for clinging on to the host during feeding. Prominent antennae project from the head adjacent to the compound eyes. You will be bitten! The initial warning of a growing infestation is from actually being bitten. The resulting irritancy of the anti-coagulant chemical around the bite site can be severe, particularly to people with soft sensitive skin. Scratching is difficult to resist but this can cause infection of the bite area. If this is a likely problem, you should consult a Doctor or Chemist to obtain appropriate medication. The bite from this insect can be very irritating. If they are allowed to multiply unchecked, numbers could become such, that the host/s may become anaemic through blood loss, although this is rare. Bedbugs are famous for biting and it is the primary reason you don't want them in your home or premises. The irritation caused by the anti-coagulant chemical that bed bugs leave around the bite site can be very nasty especially if you have soft or sensitive skin. The bites can itch and you may be tempted to scratch but you must try to avoid this as it can cause infection. instead you should ask a Chemist or your Doctor for medication if you need it. Bedbugs feed on their host by finding a bare patch of skin. It will then force the feeding tube of its mouthparts through the skin and injecting the host with its saliva. This saliva contains an anti-coagulant chemical, preventing blood from clotting. This saliva is what causes the itch and swelling associated with the bedbug bite. If bedbugs are allowed to multiply they can become a large problem that it is possible that the person they are feeding from may become anaemic through blood loss but this is quite rare. We actually have more cases of bedbugs in London and Essex than in Hertfordshire but they are a common pest in both areas. Bedbugs are generally more active at night, and infestations usually occur in bedrooms and living areas. They need to live near to a place where their food source (which may be you) is going to stay still for quite a while. If they are in your bedroom, they will come out during the night while you are sleeping. They may crawl out from a number of hiding places like the bed frame, behind loose wallpaper, any cracks in plaster or furniture or from under or behind bedroom furniture. In the living areas they are more likely found in soft furnishings like sofas, often around the arm joints or frames. You can identify the adult bedbugs as they are about 4 to 5 mm long. They have no wings and are dark brown all over. They have long legs and claws that they use to cling on to the host during feeding. They also have antennae on their heads adjacent to their eyes. As with most of our pest control treatments, we usually do two visits as a follow up visit allows us to make sure any actions we take are successful. Our fully trained pest control technician starts by talking to you about the problems you are having before assessing the situation. Please be aware that the pest controller will often need to inspect other areas and not just the visible source. Bedbugs are often brought into the home in second hand furniture, on clothes or they get into buildings from adjoining premises. The treatment for bedbugs is not simple and must be done correctly, often requiring an extra third visit. The initial treatment usually consists of a dual insecticide treatment which has to be made to the entire premises (excluding the kitchen and bathroom). residents will be asked to vacate the premises and they will not be able return for four hours. As with all our treatments, the pest control technician will leave a report with you with details of any treatments and recommendations. If a follow up visit is likely to be needed, our technician will arrange a suitable date and time with you. Generally this will be about a week or two later and sometimes a third treatment is required. I've used pest controllers before but the problem kept coming back. I chose conquest because of their guarantee but they done the job properly first time and sorted it permanently.